Some dishes are designed as a celebration—Arthur Wellesley, the first Duke of Wellington, became a national hero by defeating Napoleon at Waterloo in 1815. Beef Wellington was created in his honor. On a more somber note, the Seder is a ritual meal recognizing the liberation of the Israelites from slavery in ancient Egypt. There are other meals that allow us to revel in the foodstuffs and blessings of the moment—a day at the Farmers Market might result in a “let’s-use-what-we-found-today” minestrone soup. A weekend at the shore could invite a clambake. But for some meals, there is no celebration, no revelry, no blessing—only sadness. Some foods are born of loss and hunger and a struggle to survive. 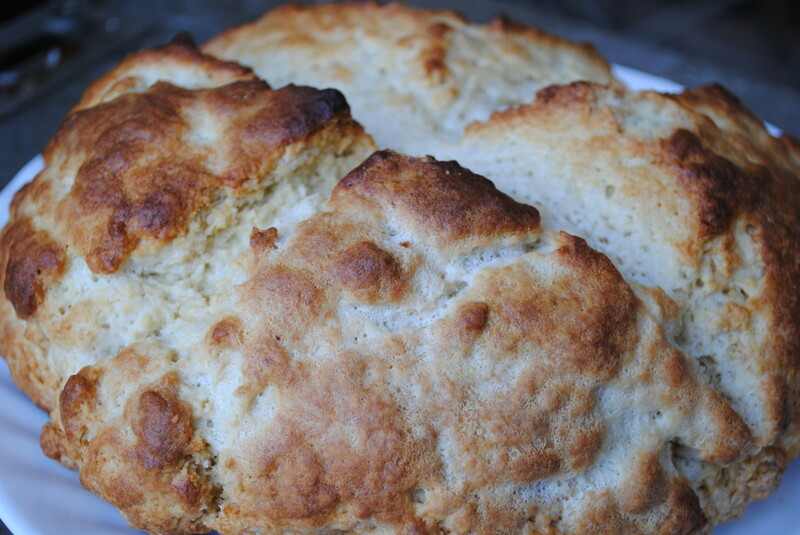 Irish soda bread is one such food. Ireland is an island in the North Atlantic, its 2,000 miles of rugged sea cliffs washed with abundant rainfall, affording it the sobriquet “Emerald Isle.” Some 15 percent of the island is covered in peat bogs, ancient lakes filled with a sponge-like mixture of sphagnum moss and mire. Subtract the cliffs, the crags, and the bogs; whatever land left suitable for farming was wrested from the mostly Catholic population. With the death of William III in 1702 penal laws were introduced; Catholics could not vote, wed outside of their religion, or keep and bear arms. Protestant sons could inherit large estates, but Irish Catholics were forced to divide their properties among all male descendants, in time shrinking their holdings to nothing more than tiny plots of rock and dirt.Catholics made up roughly 70 percent of the population but owned only 5 percent of the land. Food shortfalls were commonplace and worsened by famines in 1740 and again in 1744. The poorest of the poor were forced to eat grass for survival...until the introduction of the potato. The potato is one of the earliest cultivated foods in South America, but it did not arrive in Europe (Spain, to be precise) until 1570. Initially, there was distrust of these tubers nicknamed "the devil's apples." But then French physician Antoine Parmentier studied the potato; he concluded that it had great nutritional value and thus, throughout Europe, the potato became the most important new food of the 19th century. Potatoes grew well in the climate of Ireland and, unlike grains, could easily be stored during the winter months. 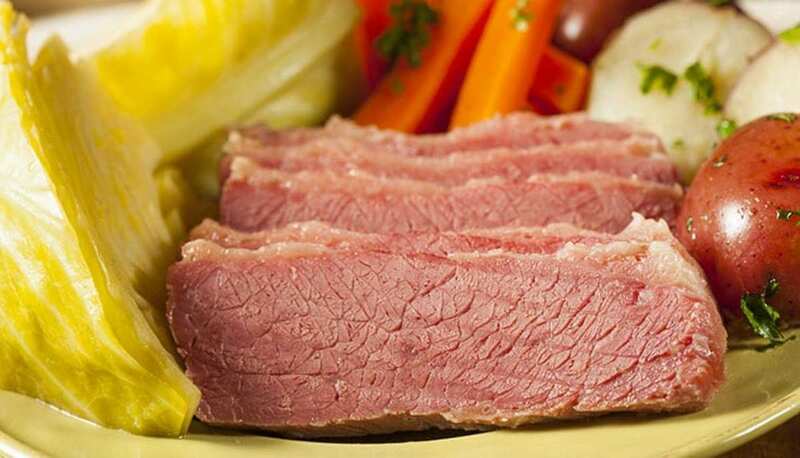 With access to this new staple food, the Irish population began to grow, and grow rapidly. By 1840 the population exploded to more than 8 million, most of them poor. This growing population subsisted on a diet comprised mainly of potatoes and milk, a bland and boring diet, but nevertheless one which provided the basic nutrition needed to sustain life. When the potato crop failed in the mid-1800’s, an estimated 1 million people starved and 2 million more left their homeland in search of survival. At the same time, a new baking product was being developed and produced—baking soda. 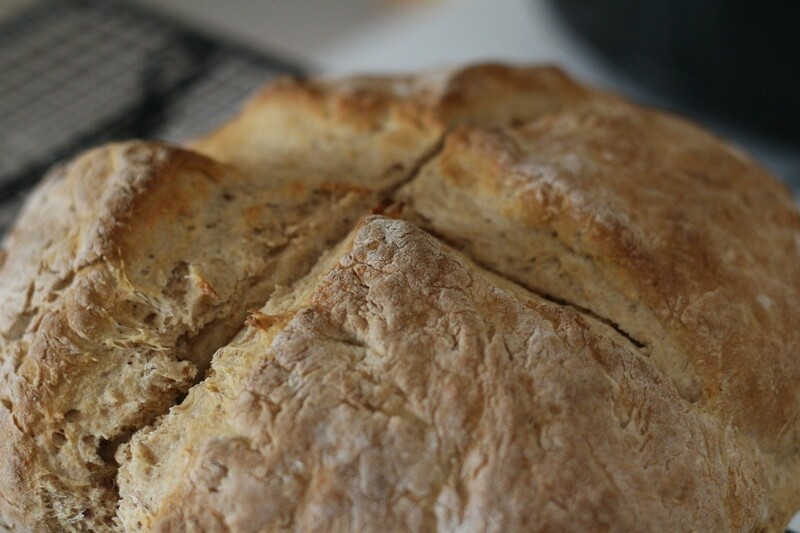 The soft wheat of Ireland (the only wheat that could endure the climate) had not been suitable for the baking of yeasted bread; it lacked the protein (gluten) that would support the leavening action of yeast. But baking soda could produce a bread that was substantial, filling, and (most importantly) could be prepared in the Irish kitchen where there typically were no ovens. A heavy pot hung over the fire or nestled in the embers, could produce a sturdy loaf for a hungry family. 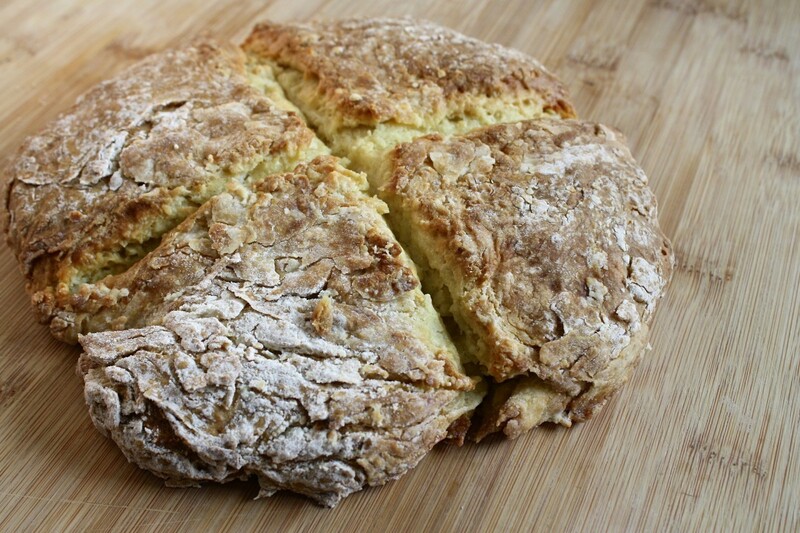 Irish Soda Bread was born. 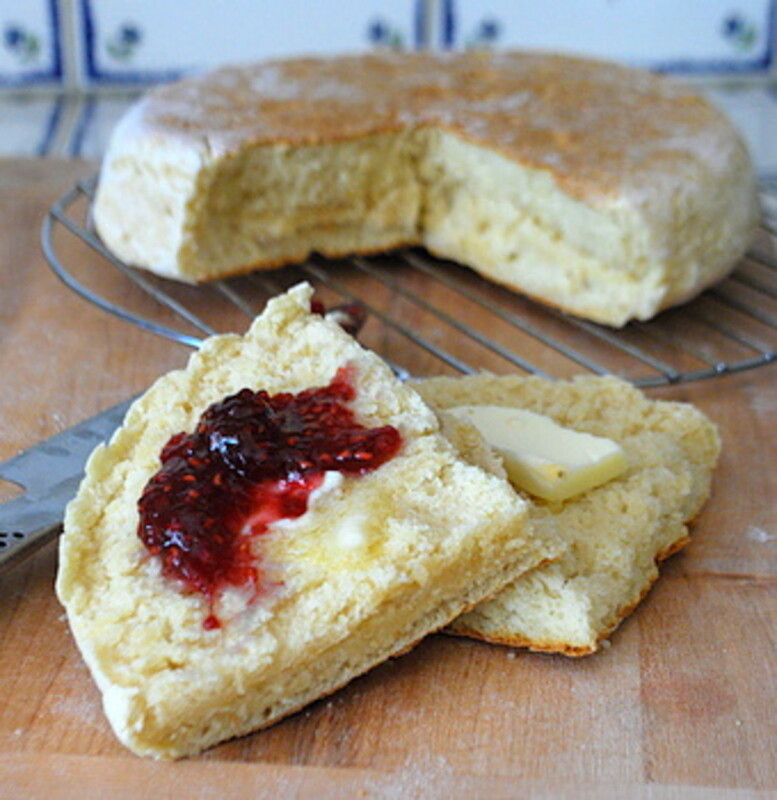 A true Irish soda bread does not contain butter, nor are there eggs, raisins, or sugar. There is flour, baking soda, buttermilk, and perhaps a bit of salt. For this recipe, I have made two subtle additions. 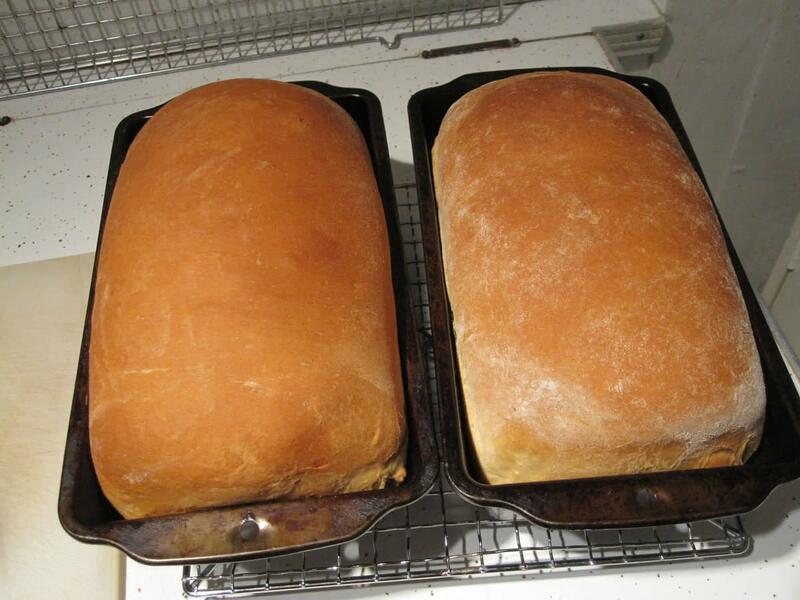 I use a combination of baking soda and baking powder so that the resulting loaves will not be quite so heavy. The second ingredient that I added to the mix was cornstarch. The blending of cornstarch into our all-purpose flour results in a product that is more closely akin to the soft-wheat flour of our Irish ancestors. Move oven rack to middle position. Sift all dry ingredients into a large mixing bowl. Make a well in the center of the flour mixture and pour in all of the buttermilk. Stir with a wooden spoon until a shaggy dough is formed. Turn out onto a lightly floured surface; knead for about 1 minute, until the dough comes together. 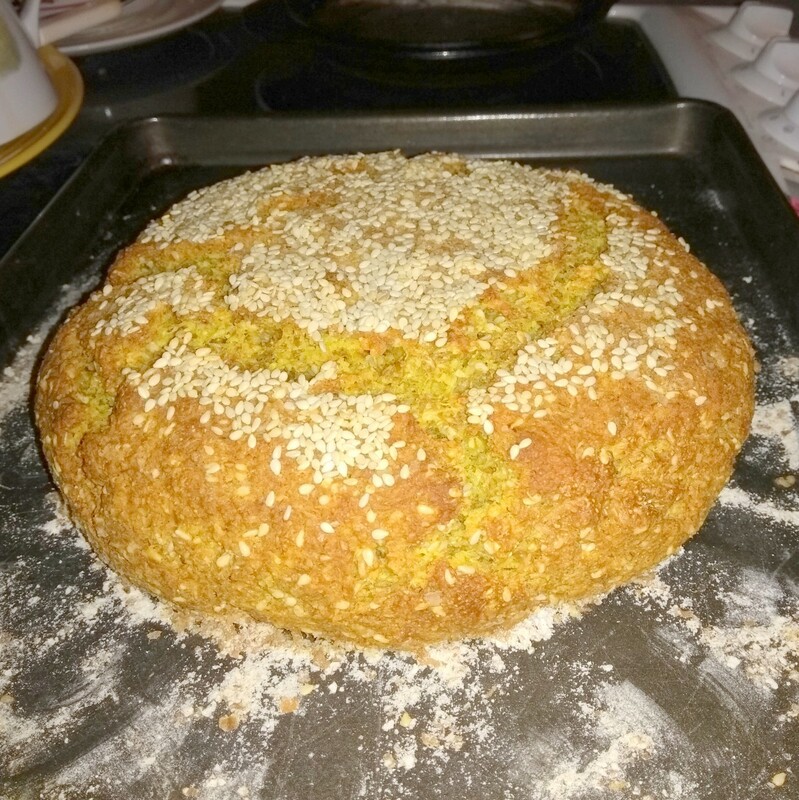 Pat into a round loaf and place on ungreased baking sheet. With a very sharp knife, cut a cross shape on the top of the loaf. Bake about 40 minutes or until the loaf is golden brown. If I didn't use baking powder while making Irish soda brad, how much baking soda would I use? For a teaspoon of baking powder, simply substitute 1/4 teaspoon baking soda and 5/8 teaspoon cream of tartar. The cream of tartar is needed to provide the acidic ingredient that makes the leavening work. Can heavy whipping cream be used as substitute for buttermilk? Some great recipes here. Though the History of what's gone on in Ireland actually goes back much further, right back to Roman times. Britain always feared invasion from Ireland much more than we did from France. Thank you, Linda. The version you have had with dried fruit, raisins, etc. is called 'spotted dog'. Thank you for your comments. The history that you've shared is very interesting. I like the look and sound of the recipe, too. I've eaten soda bread with added dried fruit, which I enjoyed, but I'd like to try the more authentic version provided by your recipe. Oh, Rachel, you know my nom de plume, of course. I don't think I could live without carbs. Blessings to you as well! RoadMonkey, I rarely if ever have buttermilk on hand, but always have sweet milk and vinegar. Perhaps I should footnote the recipe to provide that information. Thanks for the reminder and thank you for commenting. Hi Linda, I am Italian and love my Italian recipes but also enjoy other ethnic recipes. I always wanted a recipe for soda bread. Thank you for the information about the origin and the wonderful sounding recipe. As soon as my doctor releases me from this strict no carb diet, I will me making this bread. My mother i law made this every week. She was brought up in poverty in County Antrim. She had no measuring devices, just her hand, so it was a handful of this and pour that in until it mixes well. She made her bread into "farls" flat triangles, baked on the griddle on top of the stove or fire. This is a useful recipe for times when the power goes out and you have only a fire. If you have no buttermilk, you can make a substitute with a teaspoon of white vinegar to a pint of fresh milk. John Wilsdon, soda bread with raisins or other candied fruit is called "Spotted Dog." I love the names of the foods from Ireland and Great Britain (toad in the hole, bubble and squeek, etc.). Eric if you ever decide to give baking a try, this might be a good place to start. It's quite forgiving. 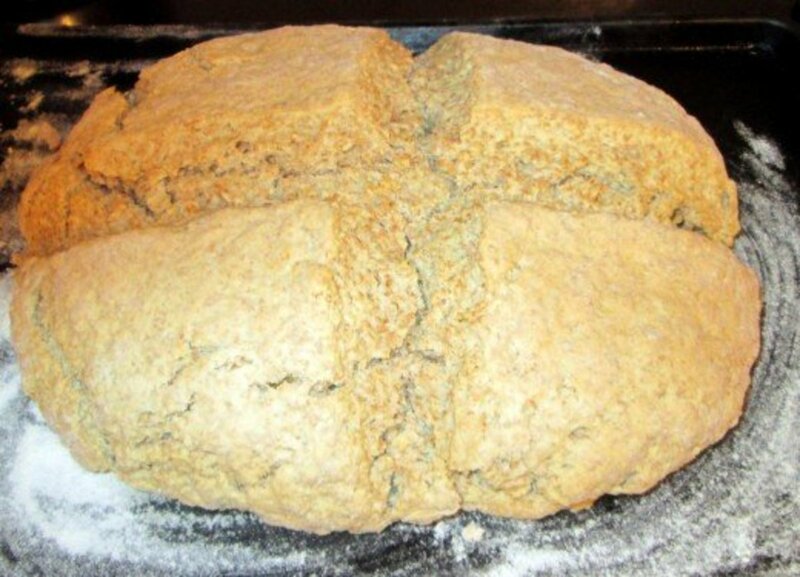 I enjoyed this article, especially because it reminded me of the delicious soda bread my mother made. 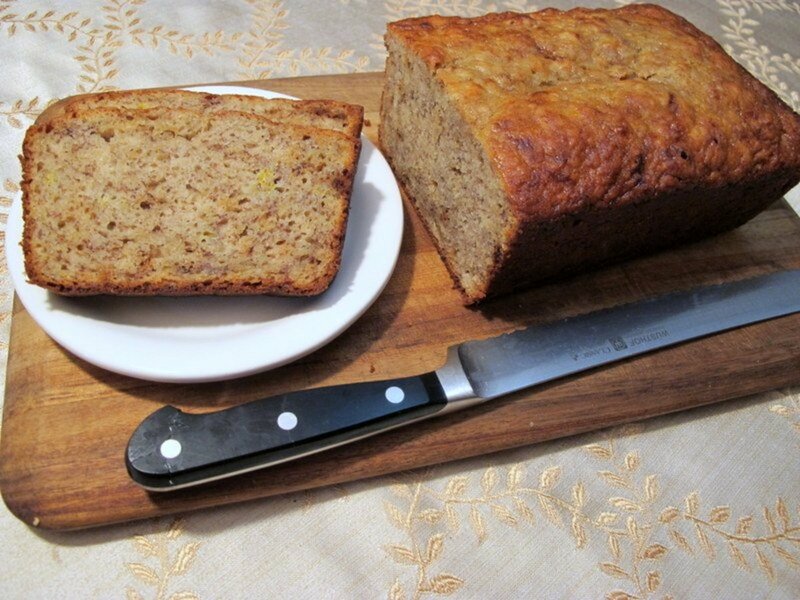 Her bread looked just like the photo, but inside she placed tiny bits of candied fruit. Perhaps that was her modification. I always enjoyed lathering it with butter! She made it for holidays, particularly Christmas. What a great history - although sad. Someday I might broaden my horizons with baking. For now I will just eat. My dear Bill, you may be many things, but stupid isn't one of them. I'm glad that I can still teach the teacher a thing or two. Have a splendid day. Good morning Mike. I'm so happy that you found my page. Please let me know if you try my recipe. Thank you for stopping by. I enjoyed reading the history and learning about the bread. I had a friend who was a very proud Irish person make me some. It was good. Flourish, my paternal grandmother's maiden name was Guinney. She was born and raised in England but was Irish through and through. How wonderful it is that you have been able to trace your family tree back so far. I imagine that Heaven will look like some parts of Ireland. This brought back memories of my family’s trip to Ireland in 2008, including the peat bogs and the very stern (angry) old Catholic woman in tattered clothes who was our tour guide and insulted Protestants, Jews, and others throughout the journey. It was one heck of a trip but we loved the country. My great-grandfather came from Northern Ireland and my dad has traced our family back for centuries.